Oldest photos on the forum? Are these the oldest photos on the forum? They were given to me by Bill Spenceley (Mid B 1924-29) at lunch the other day. 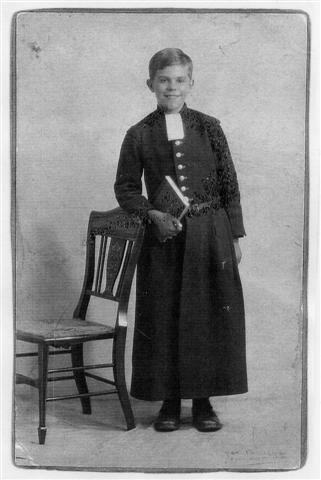 He has not yet directly participated in the forum 'though he has a lively and enduring interest in his old school. The first is of Bill in his Squits (1924) and the second a picture of the band in 1927. Bill said he was given the book to hold to make him look more academic. Bill is the euphonium player directly on the jeft of the boy with the RMS plate. 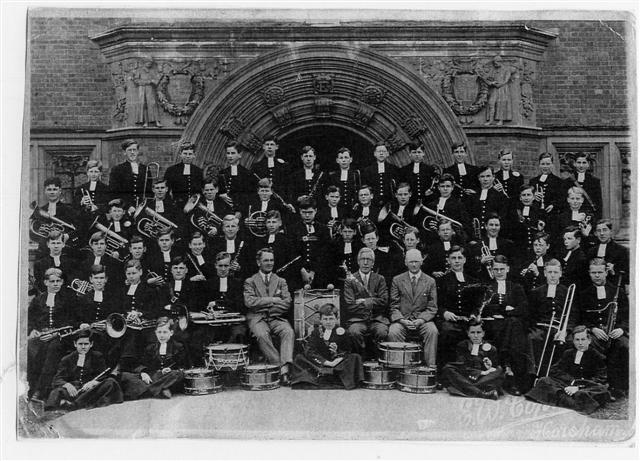 of the three seated staff, in the centre is William (later Sir William) Hamilton-Fyfe (headmaster) and on his left Mr R Wilkinson (Director of Music, 1902-1929) and on the other side the bandmaster with an extra-ordinary name which I have temporarily forgotten - anyone care to refresh my memory? Re: Oldest photos on the forum? DavebytheSea wrote: Are these the oldest photos on the forum? This also includes 1920 pictures of the 3 Maurice brothers in uniform. Wonderful, wonderful pics! You are cheating slightly, however, as they are not actually posted on the forum. I fear there are links to sites with even older pics and I don't think links count - but well done, all the same! Why not try and post them here - we could perhaps build up an important archive on this thread. DavebytheSea wrote: Wonderful, wonderful pics! You are cheating slightly, however, as they are not actually posted on the forum. I fear there are links to sites with even older pics and I don't think links count - but well done, all the same! Cheating? yes, perhaps - that is how you get things done in this world as Housie should have taught you. sejintenej wrote: Cheating? yes, perhaps - that is how you get things done in this world as Housie should have taught you. See "The Band 110 years ago" just posted. I've only just caught up with this. Immediately on the left of the euphonium player mentioned, the next euphonium player is my father Robin Griffiths (Prep B & Col B 1924-32). He graduated to the other sort of euphonium that winds around the body (I used to have a band photo - long lost - showing this). He brought it home one hols & played Bonnie Annie Laurie on it, by ear, extensively and without alternative. postwarblue wrote: I've only just caught up with this. Immediately on the left of the euphonium player mentioned, the next euphonium player is my father Robin Griffiths (Prep B & Col B 1924-32). He graduated to the other sort of euphonium that winds around the body (I used to have a band photo - long lost - showing this). He brought it home one hols & played Bonnie Annie Laurie on it, by ear, extensively and without alternative. I think you are talking about the sousaphone, which a friend from Barnes B, Miles Pinniger, played. He would put a large piece of foam on his shoulder, under his coat, because of the weight of the instrument.